Run the Jewels is an American hip hop duo, formed by New York City-based rapper-music producer El-P and Atlanta-based rapper Killer Mike, in 2013. Later that year, they released their eponymous debut studio album, Run the Jewels, as a free digital download. In 2012, El-P produced Killer Mike's critically acclaimed album, R.A.P. Music. Later that year, Killer Mike appeared on the track "Tougher Colder Killer", from El-P's Cancer 4 Cure. The following year they officially formed the duo "Run the Jewels", with an album under Fool's Gold Records, announced for later in the year. They released their self-titled debut, Run the Jewels, as a free digital download. The duo announced they would begin recording the highly anticipated sequel to their debut, in February 2014, after a series of Australian live dates as part of St. Jerome's Laneway Festival. On August 21, 2014 El-P and Killer Mike officially announced their follow up record, Run the Jewels 2. It was released through Mass Appeal Records, on October 24, 2014 to critical acclaim. 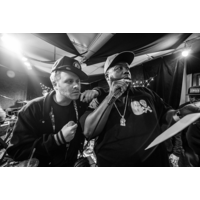 They also announced the release of a traditional remix album of Run the Jewels 2, which will be released via Fool's Gold Records in 2015, and a light-hearted remix featuring entirely "cat sounds", as of now to be titled Meow the Jewels which will feature guest production from the likes of Prince Paul, The Alchemist, Just Blaze and others. Proceeds from the latter will go entirely to charity. Killer Mike revealed that the duo will begin work on Run the Jewels 3 in January of 2015. They will also support Jack White on January 30th at Madison Square Garden. In early 2015, it was announced that the band would perform at the Coachella Valley Music and Arts Festival and the Boston Calling Music Festival in April and May respectively.